Agilent Technologies has announced the addition of four 1GHz models to its award-winning line of InfiniiVision 3000 X-Series oscilloscopes. The new oscilloscopes address the growing need for higher-bandwidth bench scopes by offering 1GHz models at prices starting at what other leading manufacturers charge for models with half the bandwidth. 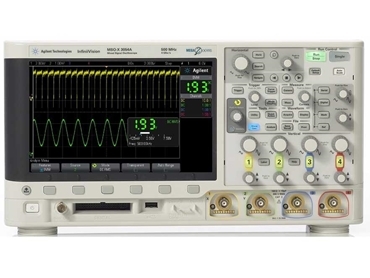 The 2000 and 3000 X-Series oscilloscopes are preferred by engineers for their combination of performance, value and innovative new features such as WaveGen, which integrates fixed-function and arbitrary waveform stimulus with oscilloscope response measurements. A new 1GHz probe, the N2795A has also been introduced with the new models, designed to match the performance needs of the 3000 X-Series oscilloscopes, at a price comparable to equivalent-bandwidth passive probes without the impedance trade-offs of a passive approach. In addition, both the 2000 and 3000 X-Series now offer the option to add a three-digit voltmeter (DVM) and five-digit counter that operate through the same probes as the oscilloscope channels. These measurements are decoupled from the oscilloscope triggering system, allowing engineers to make DVM and triggered oscilloscope measurements with the same connection. DVM results are presented with an always-on seven-segment display, keeping these quick characterisation measurements at engineers' fingertips. According to Jay Alexander, vice president and general manager of Agilent's Oscilloscope Products Division, the integrated four-in-one features of analogue, digital, and protocol analysis, plus function generator offer unmatched insight into customers’ designs at an affordable price. Adding low-cost 1GHz bandwidths and the new DVM capability extends this benefit to an even higher performance point.